This past Friday morning Mark “Sparky” Whitcomb, whose work appeared in PLAY and TIME, died peacefully at age 54 after a long illness. Calling hours will be held at the Knight Funeral Home (93 Hartford Ave., White River Jct., VT) on Monday night, April 25th, from 6-8 PM, followed by a celebration of Mark’s life from 8-9 PM. Please bring any memories or photos you’d be willing to share. Donations can be made to Bayada Hospice, PO Box 1590, Norwich, VT 05055. You can read more about Mark at the permanent memorial page that Stephen Bissette has posted. EAST MONTPELIER – The fictional world of “Watchmen”– set in a 1985 where Richard Nixon is still president and the threat of nuclear war looms over the United States – doesn’t have much in common with the idyllic, laid-back Vermont. But the writer of that comic, which sees its film version debut nationally today, enjoyed a special working relationship with two Vermont comic artists for years – Stephen R. Bissette of Windsor and Rick Veitch of West Townshend. Marek Bennett is a cartoonist, teacher, musician and also a friend of mine. His enthusiasm for comics rivals only Luke’s dedication to the Force. Really. Earlier this year, Marek released his first book collecting his comics – HOUR 72!, a collection of three of his 24-hour comics. I was present for the creation of the cover story – “Cuppy and the Gang … go on a date!” – and that experience (my first and last – for now – 24-hour comic) is also the conception of the Trees & Hills comics group (but Colin Tedford and I didn’t realize we were pregnant for several more months). Marek is throwing two parties in New Hampshire at Toadstool Books locations this month to celebrate his new book. Knowing Marek, the sessions will probably involve laughing, creating, imagination and fun. It’s probably going to be everything you have ever wanted in life. Democracy has come to the Trees & Hills comics group. This summer, Trees & Hills comics will print a best-of book. It will collect loved comics from the group’s first four anthologies – Trees & Hills & Friends, Field Guide, New Stars and Swingin’ Hits - along with a few brand new pieces to round out the collection. If you appeared in one of our first four comics, we’ll probably ask you soon if we can reprint one or more of those comics. Here’s where everyone else comes in (although contributors please feel free to do this too). We are looking for your top three comics from the first four Trees & Hills anthologies. We’d like to know which ones are reader favorites and clearly should be reprinted in our cute little book. Please also tell us which of the four comics we’ve published you’ve read, so we know which ones you are picking from. We ask that you have all your favorites in to us by April 1. Thank you! 2009 looks to be an exciting year for Trees & Hills. In addition to the best-of book collection, we also plan to appear at MoCCA and SPX, along with unveiling a brand new themed mini-comics anthology in the fall. MONTPELIER – During a recent interview to promote his film adaptation of Will Eisner’s “The Spirit” comic strip, Frank Miller remembered first discovering reprints of the cartoonist’s work in a small drugstore in Barre. That comic was a 1970s reprint of Eisner’s work decades earlier on “The Spirit,” which ran for 12 years as a supplement to newspapers’ Sunday comics section. Miller quickly devoured Eisner’s work – forever influencing his own artistic direction. More than 30 years later, Miller, who grew up in the Barre area and attended high school in Montpelier, brings his own version of “The Spirit” to the big screen on Christmas Day. The film stars Gabriel Macht as Denny Colt, a police officer who fights crime as the masked, noirish Spirit. 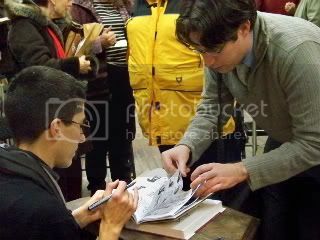 Alison Bechdel in Montpelier, Vt.
Alison Bechdel came to Bear Pond Books in Montpelier, Vt. tonight as part of her tour for the THE ESSENTIAL DYKES TO WATCH OUT FOR. 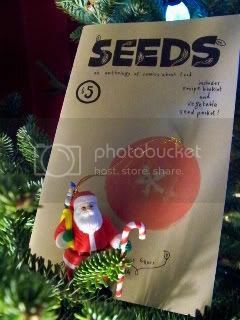 Of course, we gave her a copy of SEEDS. Henniker, New Hampshire — The weekly comic strip “Mimi’s Doughnuts” has won a coveted Xeric Grant for comic book self-publishing. With this award, creator Marek Bennett will self-publish a trade paperback anthology of the past four years of his comics. The Trees & Hills comics group will celebrate the end of a long winter this year by hitting the road for a spring tour. The 2008 SPRING THAW TOUR features the debut of several new comics by members of Trees & Hills and a chance to meet with local comic fans and other creators.